Titans Were Willing To Trade First-Rounder For Amari Cooper? The Cowboys’ decision to give the Raiders a first-round pick for Amari Cooper has brought criticism, considering Dallas’ 3-4 record and Cooper’s inconsistency. But their Monday night opponent may have viewed the former top-five pick in a similar light. The Titans were also willing to part with a first-round pick to acquire Cooper, David Moore of the Dallas Morning News reports. A Tennessee-proposed caveat may have scuttled a Cooper-to-Nashville path, however. While the Cowboys landed Cooper for a first-round pick, the Titans wanted to swap Day 2 draft slots with the Raiders to soften the blow of losing a Round 1 choice, Moore adds. It’s unclear if this means flipping both second- and third-round selections, but the Titans look to have wanted something from the Raiders the Cowboys didn’t. Cooper will debut for the Cowboys against the Titans tonight after arriving during Dallas’ bye week. The Titans (3-4) have also struggled in recent weeks and are hurting for pass-catcher depth. They lost Delanie Walker and enter tonight’s game with the NFL’s 30th-ranked passing attack. Corey Davis‘ 395 receiving yards lead the team. Tajae Sharpe‘s 222 yards are second. Marcus Mariota has only thrown three touchdown passes. 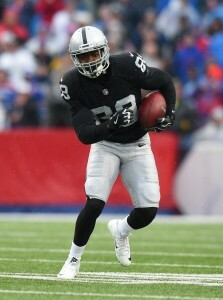 The Eagles, Colts and Redskins were also believed to be interested in Cooper, and the crowded market benefited a Raiders team that now holds three 2019 first-round picks. Zeke will be the biggest benefactor. Cooper could yet become a top receiver but he doesn’t fit well with the team identity the Titans are building. There are better ways Tennessee can use their first round pick. WR isn’t the problem. Davis and Taylor have talent. They need a better QB, Mariota isn’t that good. Could also use some Oline help! Dumb comment. the WR core is awful and outside of Lewan, so is the o-line. Conklin hasnt recovered from his blown knee and the interior line is brutal. Sounds like some bs leaked by the Cowboys to make themselves look better.